I have the opportunity to test a UP! printer from PP3DP. But now I'd like to show you my first print with the UP! Having a Rapman my first thought was that the UP! is really tiny ! It's said to be transportable and that is for sure compared to the Rapman. It's construction seems robust and it can easily be transported (5 kg). But having such a small machine implies a small printing area. The UP print bed is 14cm x 14cm. It seems small but when you think about it, it's more reasonable than having a Rapman size one on which you can't really print big sized objects due to warping. And for warp fighting the UP! comes with a heated bed that proved to be efficient ! After carefully reading and following the instructions and calibrating the beast, I was UP! for my first print. It's a SU designed case for my just received Raspberry Pi. It has thin walls (1.5mm) and very small details. I think it's just impressive ! The raft is very thick (2mm - lowest I could choose) but includes some "tubing" and proved to be very efficient : sticked well to the bed and went off well from the part. And no warping ! The details are all very well done and the print was quiet fast for a "slow" setting. In one word : wonderfull ! Thas that mean it is the perfect machine ? 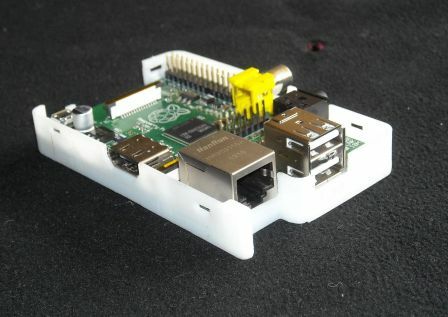 The Pi fits quiet well in the bottom case but it needs a bit more space (I think 0.1mm should do). So I'm gonna modify my SU design and print again. When it will fit perfectly I will then print the top of the case that is allready designed. And when everything will fit perfectly it will be made available for download. But for now I have decided to print Hairygael's InMoov robot hand and to build it UP! ... and stay tune for my next UP! related coming posts.